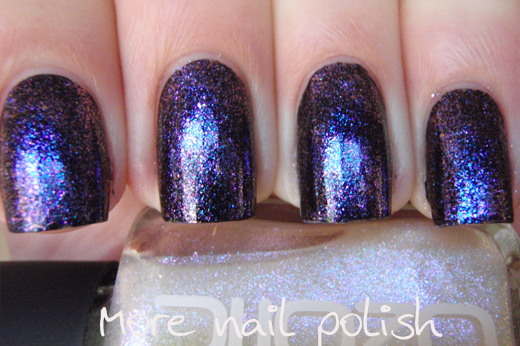 Alrightly now, moving on to blog post number six tonight, featuring the second polish from the Beam range. 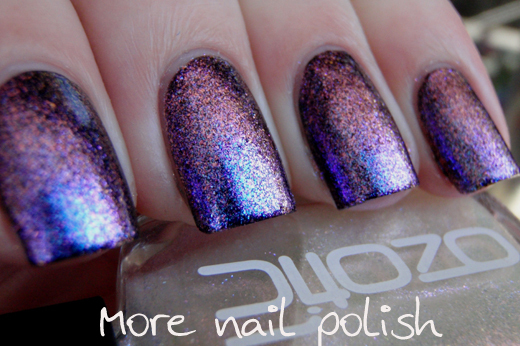 Ozotic 906 Beam again has multicoloured glass flecks, this time with a predominance of pink and blue. 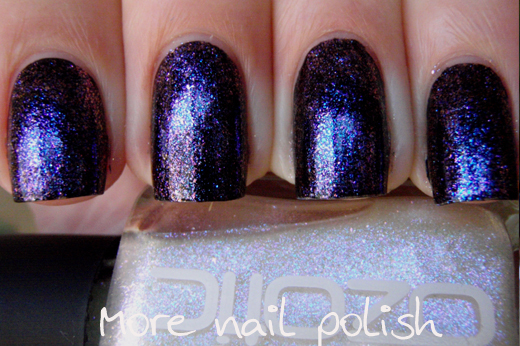 This polish seems to prove my theory of the duochrome flecks, because when you look at the second photo you can see a clear blue/pink duechrome and the macro shot also shows purple and orange/gold hues. 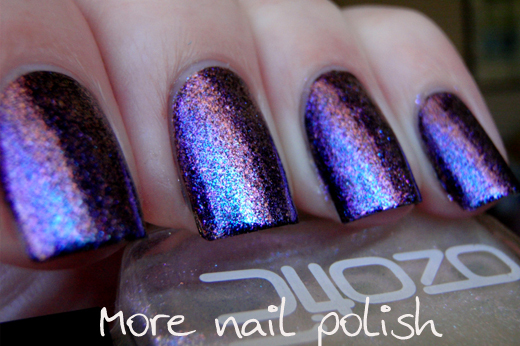 While the second photos shows a beautiful duochrome, I think the best description would be a speckled finish of pinks and blues. 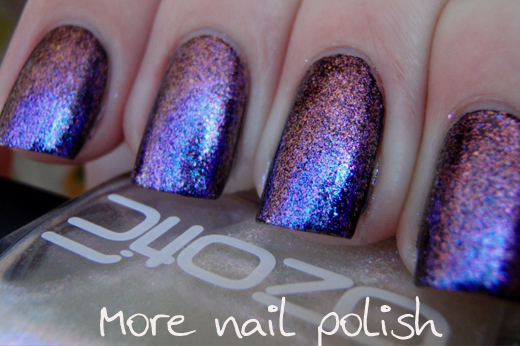 I dunno, its really had to describe the colours and finishes of these polishes. As with all the Beam range, this is translucent and milky looking in the bottle. When you have all the bottles next to each other they are almost identical, but if you get some light on the bottle you can see all the individual flecks. Also, like all the other polishes in the 900 series, if you plan to just wear one coat over black, take care not to wipe to many times or you will end up with bald patches. These first photos are one coat over black. 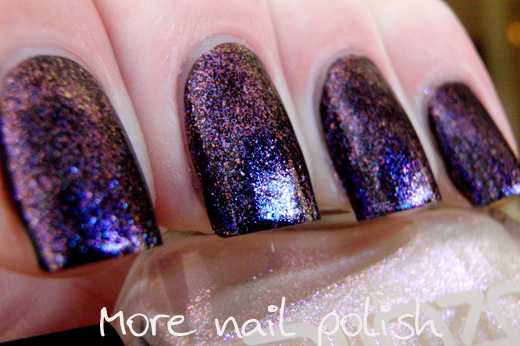 Now showing two coats layered over black. 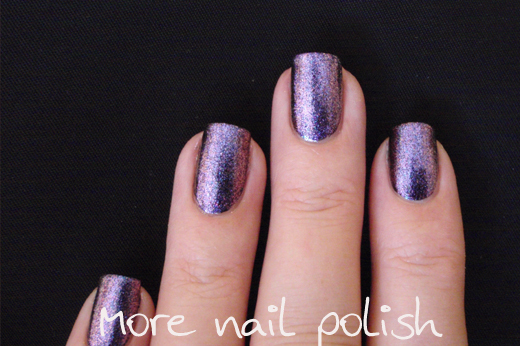 The effect on your nail at a bit of distance is more like a pink and purple foil. 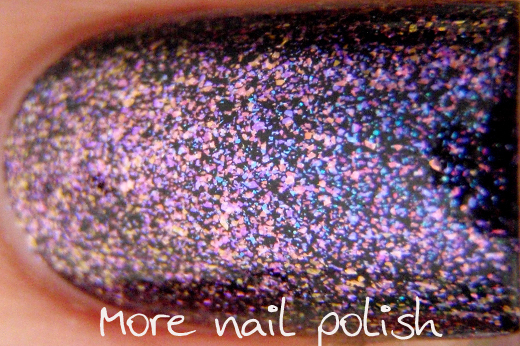 Without a black base the polish the polish has a soft pink hue, even though in the bottle it's white. This was three coats, and I was very happy with the coverage. My nails are quite a horrid yellow stain and even the subtle colour and glass flecks in this covered that all up with three coats. It is beautifully sparkly in the sun and very versatile, achieving very different colours depending on what it is layered over. Only two more 900 series polishes to share tonight, hang in there everyone! 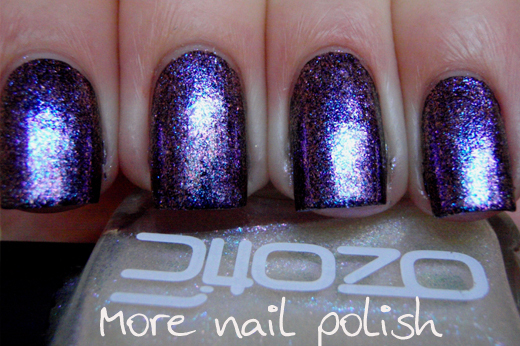 The new Ozotic 900 series polishes cost $13AUD and are available from Picture Polish. They are also available for $15.50 (or equivalent in their currencies) through all the Picture Polish Network members. 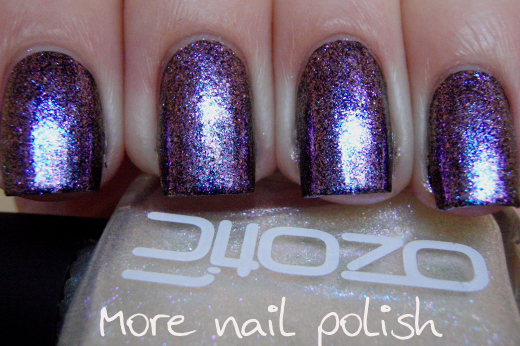 This polish was sent to me for review, see my disclosure policy for more information.